Vol. 2, No. 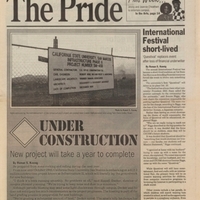 1 of The Pride cover stories look at the next stage of construction on campus and the "Questival." September 7, 1994,” University Archives at the CSUSM Library, accessed April 20, 2019, https://archives.csusm.edu/student-newspapers/record/90.